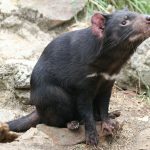 Tasmanian devils, found in Tasmania, Australia are the largest marsupial carnivore. 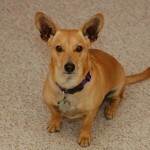 They have rat-like features, brown or black crude rough fur and sharp, pointed teeth. 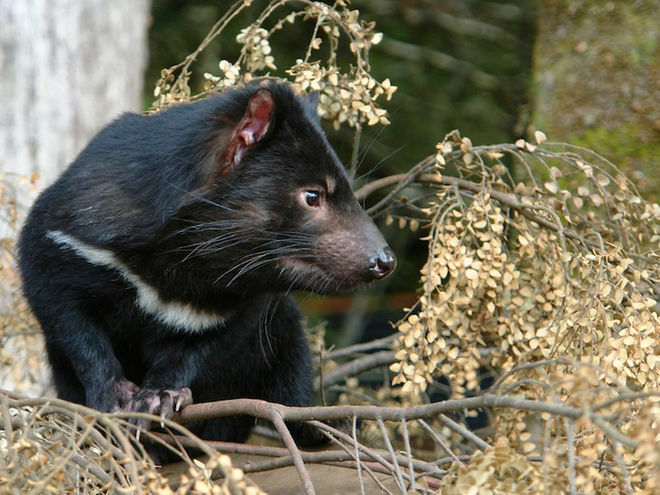 They are found only in the coastal scrublands and forests of Tasmania. As a result of intensified hunting, their number has drastically decreased in the first half of the 20th century. They are mostly considered as pests by farmers and villagers, therefore they are often hunted by them. But since 1941, strict measures have been taken to protect them from a facial tumor disease that is incurable, infectious and fatal. 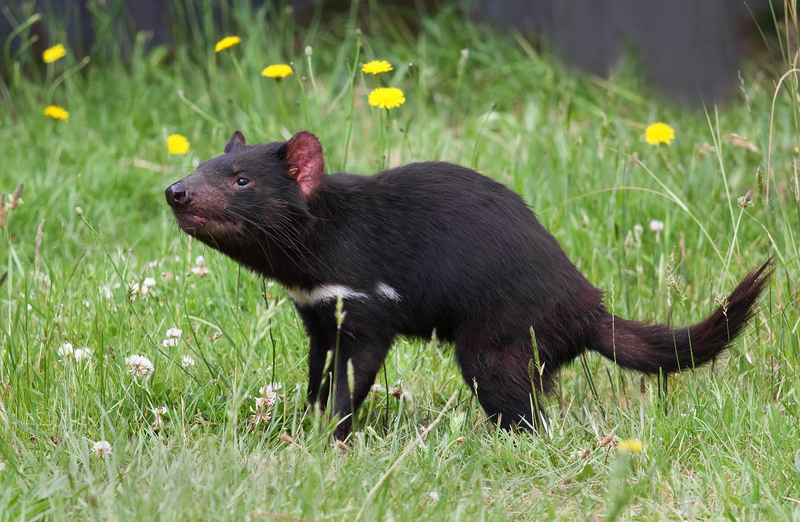 Most of the time, Tasmanian Devils are known just as devils. 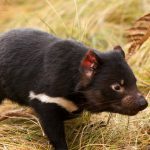 The symbol of Tasmanian National Parks and Wildlife Service is Tasmanian Devil. 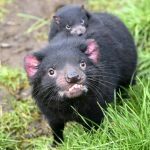 The main reason behind the decline of the population of Tasmanian Devil is a facial tumor that has rummaged them and caused about 20-50% decrease in their population. 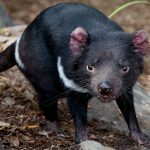 The disease has spread over 65% of Tasmania. 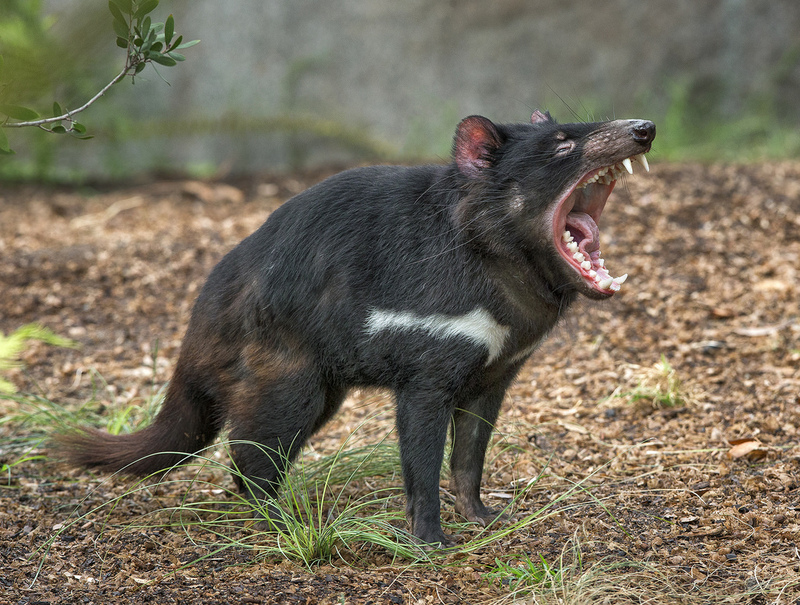 The front legs of Tasmanian Devils are longer than the back ones. They store all the necessary extra fat in their tails. They are excellent tree climbers but awkward on the ground. 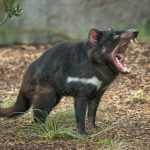 According to National Geographic, Tasmanian Devils have one of the most impressive bites in the animal kingdom because of their muscular, strong jaw. 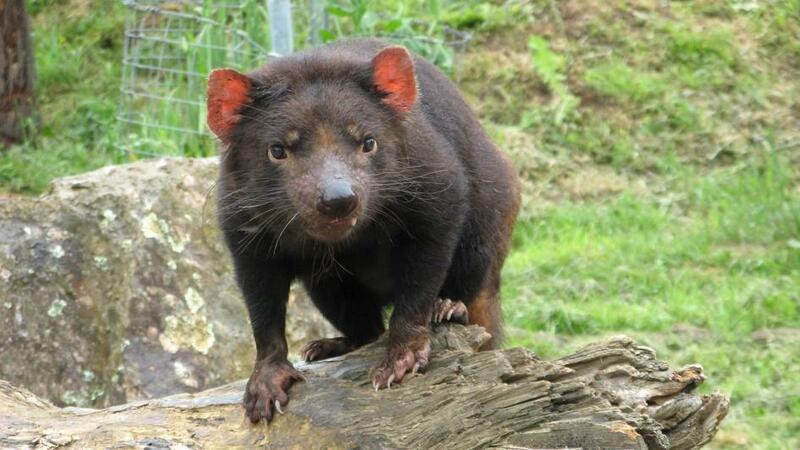 Tasmanian Devils are the largest carnivorous marsupial animal with a body length ranging between 52 and 80 cms. 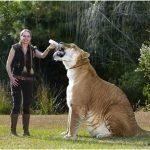 Their weight ranges from 4 to 12 kgs and the tail length is between 23 and 30 cms. They have black or brown coarse fur with spots on their sides and rump along with a white patch on the neck area. They have a huge head with a stout built, a strong jaw and firm powerful teeth to adapt to their diet. They are aggressive animals and all of their fat is stored in their tails. 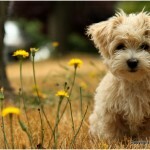 Therefore, a weak tail will determine an unhealthy animal. When rummaging in the dark, they use their whiskers to detect their prey or other devils. Similar to a skunk, they can produce a foul, pungent smell when flustered. 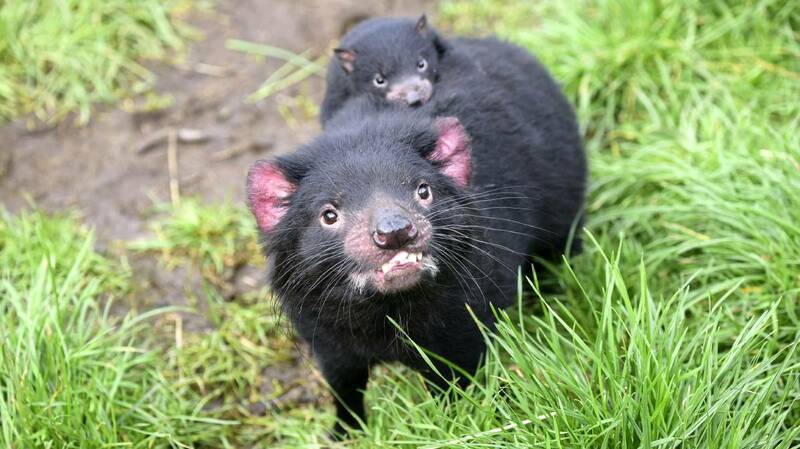 Tasmanian Devils have an immense strong sense of taste, sight, touch, hearing and smell. Their vocalizations vary in a huge range, from intimidating growls to aggressive screeching noises depending on their communication. 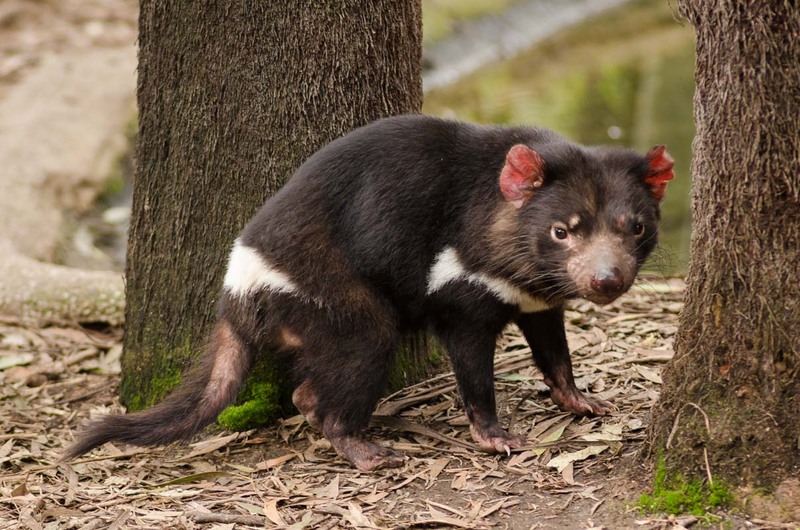 Tasmanian Devils usually prey on carcasses and remains of dead animals. They rarely hunt for their prey. They are a strategic beast that eats whatever is available easily, mostly reptiles, small mammals, frogs, birds and fish. They are one of the very few species that eat the fur and bones of carrion and leave no traces of the carcass. If given an opportunity, they can eat about 40% of their bodyweight in under 30 minutes, though they usually eat 15% of their body weight on average. 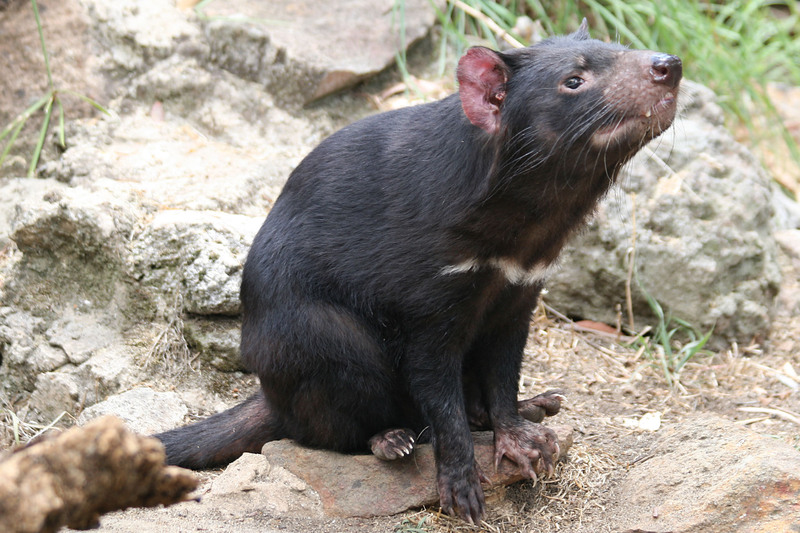 Due to their uproarious joint-feeding habit with other Tasmanian Devils; they can be heard from many miles away. 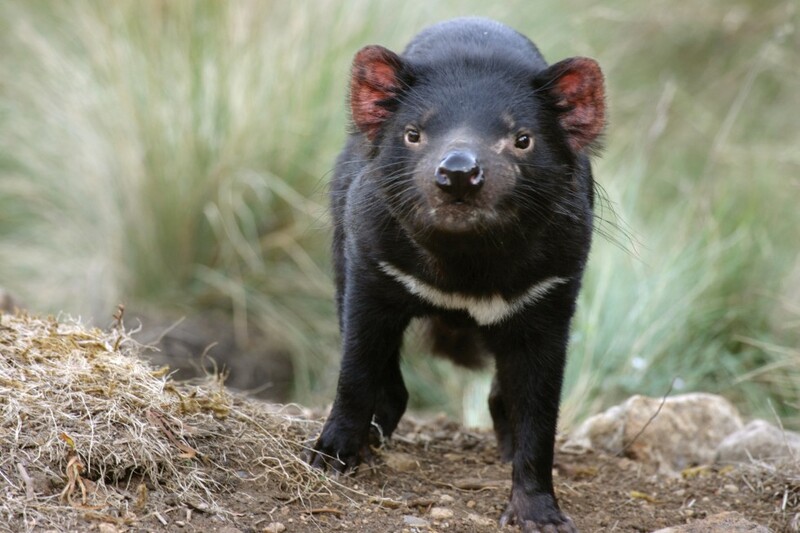 Tasmanian Devils are lonesome animals that are found widely in the habitats of Tasmania. They occupy territories of 8-15 square kilometers in forests and spend the daytime hiding in bushes. 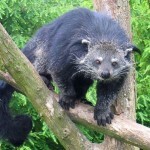 They are nocturnal animals that operate only in the night when they come out to feed. 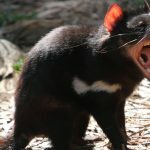 The mating period of Tasmanian Devils starts in March. With a gestation period of 21 days they give birth to 2-3 babies. The newborns remain attached to their mothers for 4 months with the help of a teat in the mother’s rear opening pouch. They are then moved to a den. After that they are weaned till 5-6 months and finally reach an independent self when 8 months old. Once they become 2 years of age, they turn sexually active. 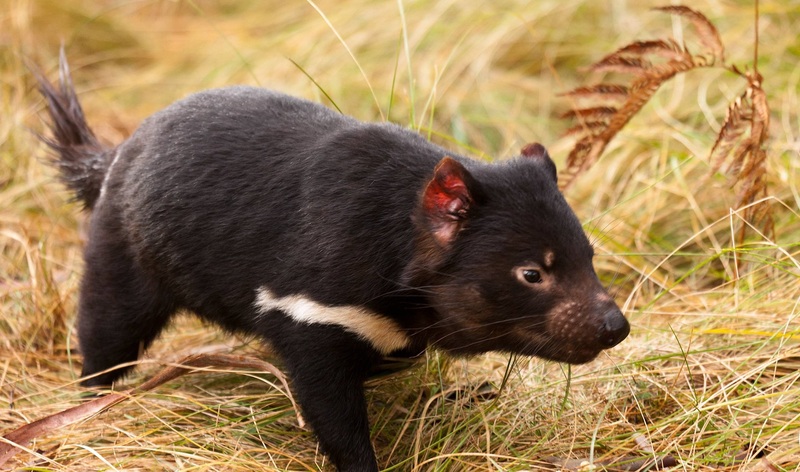 Very few natural predators hunt for Tasmanian Devils, but the smaller ones usually become the targets of spotted tail quolls, eagles and owls. 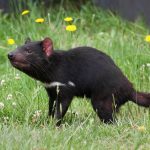 It has been observed that Tasmanian Devils have adapted to nocturnal behavior for escaping predation by humans and eagles, as the weak ones usually fall prey to them. 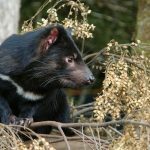 Young Tasmanian Devils can climb trees, which is an adaptation of escaping since sometimes, adult Tasmanian Devils eat their own young ones when hungry. 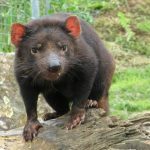 Tasmanian Devils can also swim up to 50 meters even through icy cold waters. They are solitary animals that live their whole lives alone once weaned and never form packs. For these animals, securing food is less important than securing a den and usually adult Devils spend their entire lives in the same den. Male Devils need more food as compared to female Devils; therefore, they eat more and travel less. 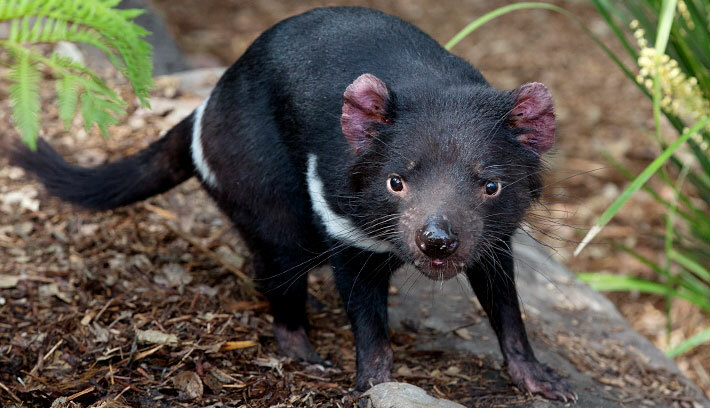 These animals are popular for stealing blankets, bed sheets and other clothes in order to use them in their dens. 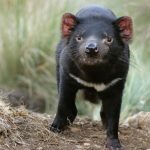 In general, Tasmanian Devils are non-territorial but females are considered more territorial than males and are more protective of their dens. Ancient Devils were larger in size in comparison to their descendants. 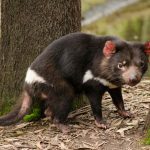 However, the number of population of Tasmanian Devils has declined considerably in the last few years. The cause is unknown, though it is said that the increase in human population, extensive hunting by some people and competition with other animals or a combination of all three has helped them to go down in numbers.. Cancer is one of the major causes of the extinction of these animals.